Batch Word to PDF Converter is a smart tool that is must for anyone who uses computer for personal or professional use. Microsoft Word is considered as the best tool for creating your files. You can produce your work in an efficient manner when using Microsoft Word. But, it is not a very good source for sharing the files with others. For this purpose, PDF is the most famous format for transferring and sharing the files. 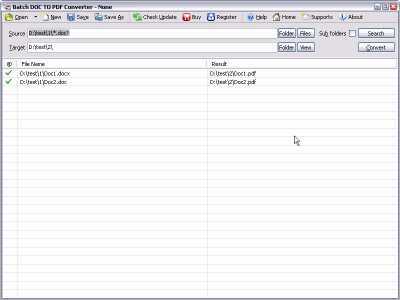 To convert a Word file to PDF, there is nothing better than Batch Word to PDF Converter. This is the most convenient tool available at the moment for the conversion. Unlike the other similar tools, it allows you to convert the bulk of Word file at the same time. This software does not need any support from other software like Adobe Acrobat. It works fast and let you save your time. So download this software and convert you word file to PDF with convenience now! Most of the similar tools make a separate PDF file for every Word file. This causes a lot of mess sometimes. Batch Word to PDF Converter lets you make one PDF file for all word files. You can merge all your converted files into one PDF file for your convenience. This app has very powerful features yet it is very lightweight. It requires few MBs on your disk to start working. It means you can save your disk space for other stuff. Batch Word to PDF Converter also has security features to protect your PDF files. You can apply printing or copy preventions to your PDF files when sharing them. Apart from this, you can set a security password to control the security of PDF files. Batch Word to PDF Converter is easy to use. It has simple user interface and works very fast. You can stop or pause the conversion and continue at any time. All you have to do is to create a list by dragging word files, click start, and leave it to work. This tool works fast. It can convert bulk files to PDF format in minutes. It is truly a time saver for people with many conversions. Batch Word to PDF Converter offers support in many languages. It supports English, German, French, Arabic and many more. To operate this tool you need Windows XP, VISTA, 2000 – 2012 and Microsoft Word 20000-02013. Do not look for anything else and download Batch Word to PDF Converter now to enjoy its top features now!